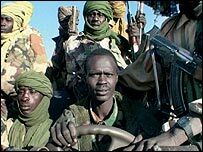 The biggest rebel movement in Sudan's war-torn Darfur region has chosen Minni Minnawi as their new leader. 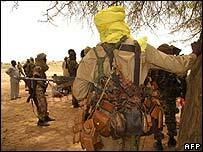 But Sudan Liberation Army's choice of Mr Minnawi seems certain to split the group, long beset by rivalries. He was chosen at their unity congress and replaces Abdul Wahid, who boycotted the meeting. Any split would further complicate already difficult efforts to resolve Darfur's crisis, which has driven more than 2m people from their homes. For the last six days the SLA has been holding its congress deep in rebel-held Darfur. Its slogan was organisation, unity and peace. By electing Mr Minnawi as its new president the rebels now seem destined to split such is the animosity between him and his predecessor, Mr Wahid. Mr Wahid says he will not recognise the congress' decisions. His popularity has fallen after he spent most of the last two years outside Darfur. Mr Minnawi by contrast is a military man and has much greater support among commanders on the ground. The next round of peace talks with the Khartoum government is due to resume in two weeks' time. Six previous rounds failed - in part because of divisions among the rebels. As mediators the African Union must now decide who they consider SLA leader and hence who will attend the next round of talks.